The Good Food Festival, which takes place on Saturday, March 18, is FamilyFarmed‘s annual public celebration of the fast-growing Good Food movement — and this year, for the first time, admission is free! It is the wrap-up for our three-day Good Food Festival & Conference, which includes the Good Food Financing & Innovation Conference on Thursday, March 16 and the Good Food Trade Show & Policy Conference on Friday, March 17; tickets for these programs are on sale now. There is also time for farm and food businesses to sign up as exhibitors and vendors for the Friday and Saturday programs. If you are interested in reaching a coveted audience of trade buyers, sellers, investors and consumers, please click here for more information. Please enjoy… and share… the following story about our 2017 Good Food Chef of the Year Award and our Chefs at Play programming. Legions of fans have packed Chicago’s Honey Butter Fried Chicken since its 2013 opening, and they might say it merits FamilyFarmed’s Good Food Chef of the Year Award for its delicious food alone. But the reasons why chef-owners Christine Cikowski and Josh Kulp will be co-honored — and then conduct a chef demo — at our Good Food Festival on Saturday, March 18 go much deeper. Cikowski and Kulp have practiced sustainable and local sourcing since they launched Honey Butter Fried Chicken, after first establishing themselves with their ongoing Sunday Dinner Club (located just above the restaurant in the city’s Avondale neighborhood). 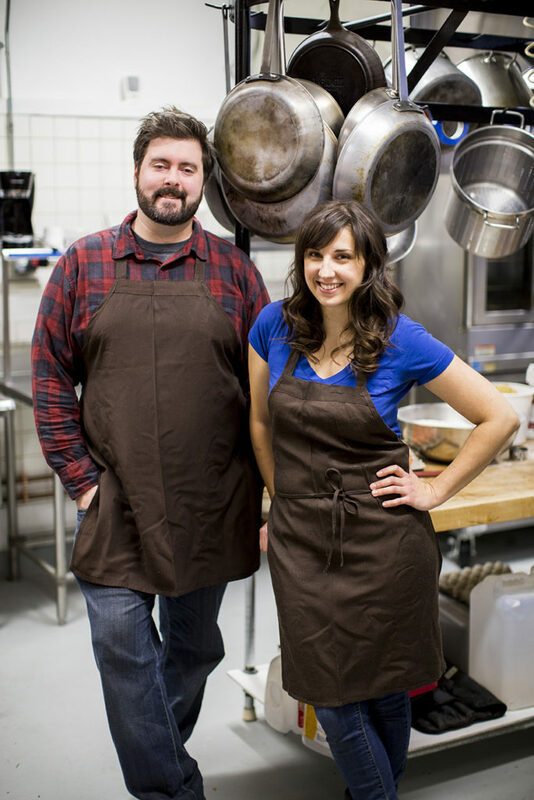 Josh Kulp and Christine Cikowski, the chef-owners at Chicago’s Honey Butter Fried Chicken, will receive FamilyFarmed’s 2017 Good Food Chef of the Year Award at the Good Food Festival on March 18. Photo courtesy of Honey Butter Fried Chicken. Good Food sourcing is no easy thing for fine-dining farm to table restaurants to do, and even more challenging for fast-casual restaurants that work at higher volumes. Yet Cikowski and Kulp, who became friends while studying culinary arts at Chicago’s Kendall College, have stuck to their devotion to sustainability by purchasing Amish-grown chickens from Indiana and fresh local produce, often visiting local farmers markets for ingredients and new ideas. 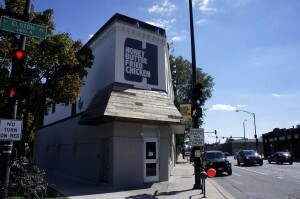 Good Food on Every Table wrote about Honey Butter Fried Chicken just before the restaurant opened in September 2013, and again in 2014 as the owners discussed their successful first year. 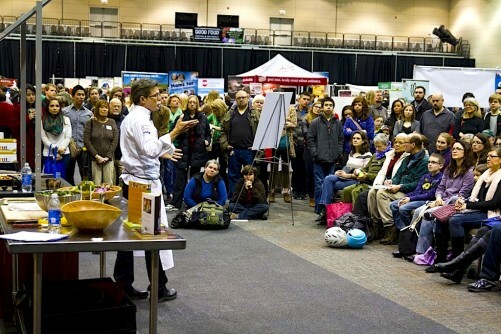 And this year’s Good Food Festival will be a return engagement for Cikowski and Kulp, who shared the Chefs at Play stage in 2016 with famed chef-restaurateur Paul Kahan — our 2016 Good Food Chef of the Year — in a demo that promoted Pilot Light, a program in which they are all involved that works to integrate food education into the curriculum at Chicago Public Schools. The Chef of the Year Award will takes place at 10:30 a.m., followed immediately by the Honey Butter Fried Chicken demo that will run until 11:15. That will kick off our first day-long Chefs at Play program, which will continue until just before the Festival concludes at 5 p.m. The Chefs at Play will include longtime favorites at the Good Food Festival. One of these is Rick Bayless, whose Frontera Farmer Foundation is collaborating with FamilyFarmed on a major fundraising event on April 30 at the Art Institute of Chicago: The Frontera 30th Anniversary Celebration, marking the 30th anniversary of Bayless’ landmark Frontera Grill. Bayless will also take part in a panel discussion, titled “Does Good Food Need to Be Local?” that will take place at 9:15 a.m. on Friday, March 17 during our Good Food Trade Show and Policy Conference, the middle day of our three-day Good Food Festival & Conference. Also familiar to Festival-goers is Rob Levitt, the head butcher and owner at Chicago’s The Butcher & Larder at Local Foods. After several years of doing meat-related workshops at the Festival, Rob will dust off the chef’s hat that he wore for many years before opening The Butcher & Larder (at a different location) in 2011. 10:30-11:15 a.m.: Honey Butter Fried Chicken Good Food Chef of the Year Award and demo. 11:30-11:50 a.m.: Purple Asparagus with Tom Van Lente. Purple Asparagus, which brings fun food education programs into schools, has long been involved in the Good Food Festival’s family-friendly programming. This year, they take to the stage with Chef Tom Van Lente of The Winchester restaurant in Ukrainian Village. Noon-12:45 p.m.: The Artisan Grain Collaborative. The Artisan Grain Collaborative will showcase and demonstrate the process of milling locally grown wheat — and baking a sourdough bread! We will present an up-close opportunity to see and learn the traditional methods of stone milling wheat into flour, and using that flour to bake a healthy and locally sourced loaf of artisan bread. 2-2:45 p.m.: Paula Haney, Hoosier Mama Pie Company. As Hoosier Mama’s old-timey slogan goes, “Save Your Fork, There’s Pie.” Hoosier Mama Pie Company has been one of the Chicago area’s most popular bakers since it opened in 2009, in part because of Haney’s dedication to artisan ingredients. Along with two restaurants, Hoosier Mama Pie is a longtime vendor at Chicago’s Green City Market. 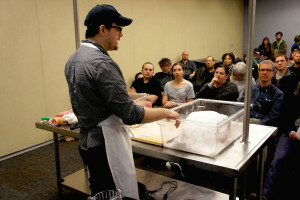 3-3:45 p.m.: Rob Levitt, The Butcher & Larder at Local Foods (see above). 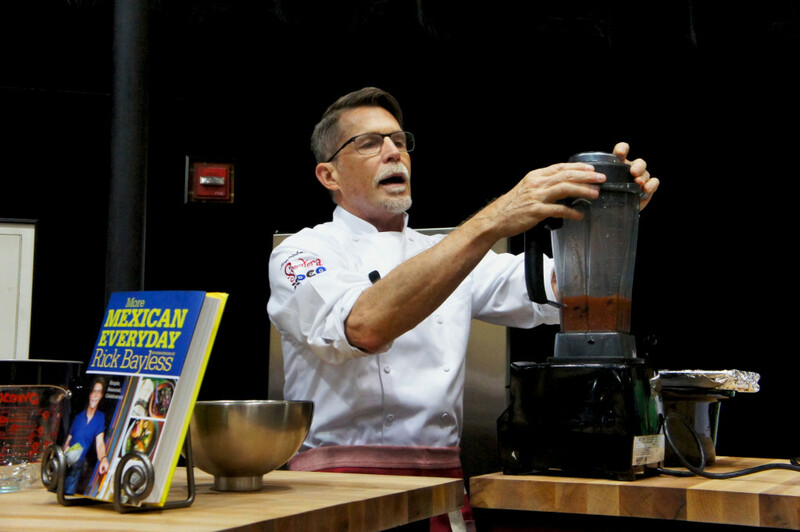 4-4:45 p.m.: Rick Bayless, Frontera group of restaurants (see above). 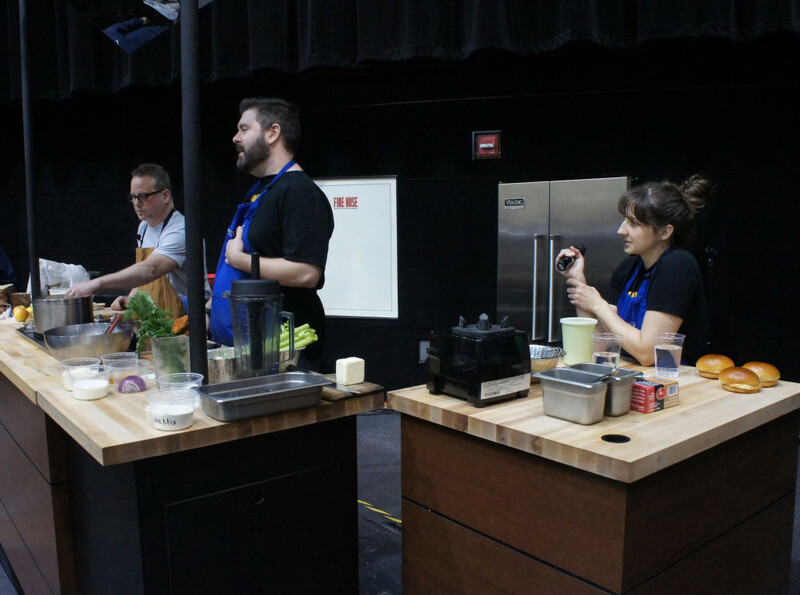 The Chefs at Play stage is located in the UIC Forum’s main Exhibit Hall, and for the first time extends to nearly the closing time for the Festival. We hope this will encourage attendees to spend extra time visiting our awesome exhibitors and vendors — many of whom will have great products for you to buy and take home. 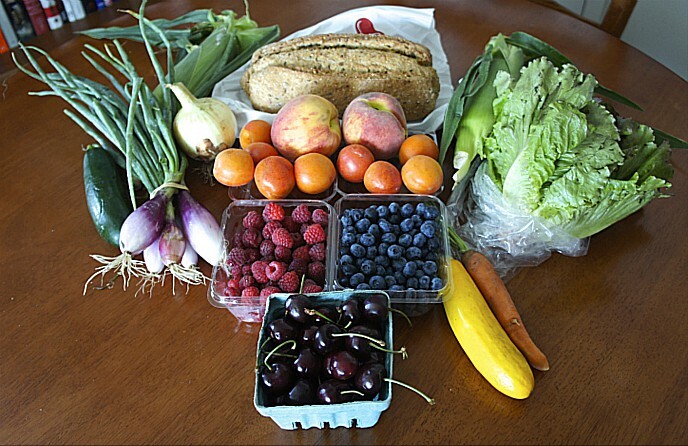 Do your grocery shopping at the Good Food Festival! This entry was posted in Awards, Chef activism, Chef advocacy, Farm to table dining, Fast/casual restaurants, Food activism, Food and community, Food Entrepreneurs, Frontera Farmer Foundation, Good Food Dining, Good Food Festivals, Good Food restaurant trends, Good Food Success Stories, Local Food, Poultry, Restaurants and Good Food and tagged Artisan Grain Collaborative, Christine Cikowski, FamilyFarmed, Frontera 30th Anniversary Celebration, Frontera Farmer Foundation, Frontera restaurant group, Good Food Chef of the Year, Good Food Festival, Good Food Festival & Conference, Good Food Financing &Innovation Conference, Good Food Trade Show & Policy Conference, Green River Chicago, Honey Butter Fried Chicken, Hoosier Mama Pie Company, Josh Kulp, Kendall College, Local Foods Chicago, Paul Kahan, Pilot Light, Purple Asparagus, Restaurant Opportunities Center, Rick Bayless, ROC United, Sanctuary Restaurants, Sunday Dinner Club, The Butcher & Larder, The Winchester restaurant Chicago. Bookmark the permalink.